It is tradition, here are Chez Interrupted, to post my New Year’s Resolutions. As I sit here today, reviewing previous posts and reflecting on the past year, I realize that this year’s resolutions are pretty much the same as last year’s, and the year before that. I guess that it’s easy, in a way, always trying to work on the same stuff, but does that really amount to improving myself? Lastly, yoga. Yeah. I’ll get right on that. What I needed was a witty retort. On Sunday, Mr. Interrupted’s grandmother took us (including his 4 cousins, aunt, uncle, father, father’s wife, and one of the cousin’s bride-to-be) all out to have brunch at “The Club”. Now, there are two things you need to know. First, I am not a “The Club” person. I am descended from a long and proud line of emphatically blue collar folk. I may be the first person in my family history to ever have brunch at “The Club”. Second, no one told us we’d be going to brunch at “The Club” so I failed to pack appropriate “The Club” clothing for myself, the children, and Mr. Interrupted. He and I wore jeans and a nice top. The kids wore jeans and their snow boots. We arrived, feeling festive and ready to eat and socialize. After they took our drink orders, I took the boys up to the buffet line to get them some food. It was then that Some Woman approached me and said, “Excuse me, just so you know for next time, jeans are against The Club rules.” Of course I apologized and explained that I didn’t know we’d be coming to “The Club” today. It’s possible that I said something that sounded sarcastic like, “well, if I’d known…” Whatever. But after a while I realized that I felt really embarrassed about not having the proper attire and mortified that someone thought they had to tell me about it. I was so embarrassed that, since the dining area was filled with snooty, jacket-wearing “The Club” members, I didn’t go back to the buffet for more food, even though I was still hungry, or for any dessert, even though I really wanted to try their carrot cake which looked very sinful and delicious. I just felt too uncomfortable and unwelcome. Now, a day later, I’m angry. I mean, why should I have to apologize for how I was dressed for gods’ sake? It’s not like I was all schlobby in torn sweat pants and a dirty tee-shirt. Geez. And I keep wishing I’d said something to that woman to turn the tables on her–to make her feel bad and embarassed, but I can’t think of anything appropriately scathing and hilarious. Any suggestions? Using Judy’s Magic CO, cast on 6 stitches (3 per needle). Knit one round (knitting into the back of each stitch on the second needle according to the directions found here). Round 2: Knit, closing up the YO’s by knitting into the back of the loop. Round 4: same as round 2. There are now 14 stitches total. Work plain stockingette stitch for 7 or 8 rounds. Knit to last two stitches, wrap and turn the next stitch*. Slip wrapped stitch. Purl to last two stitches, wrap and turn. Slip wrapped stitch. K2, wrap and turn. Slip wrapped stitch. P1, wrap and turn. Slip wrapped stitch. K1. The next stitch to be worked is a wrapped stitch. Work wrap**. Turn. Slip 1, K2. Work wrap. Turn. Slip 1, P3. Work wrap, turn. Slip 1. Knit to the gap. SSK. Resume working in the round, knitting across the “instep” stitches. Work plain stockingette stitch for 8 rounds. Work 3 rows 1×1 rib. Bind off all stitches, leaving an 8 inch tail to make a hanging loop. *Wrap and Turn (knit side): with the yarn in front, slip the next stitch. Turn work. Yarn will now be in back. Move yarn to front. For purl side wraps, move yarn to back of work before slipping the stitch. **Work Wrap: From the knit side, lift the wrap over the stitch and onto the needle and knit the wrap and the stitch together through the back loop (tbl). 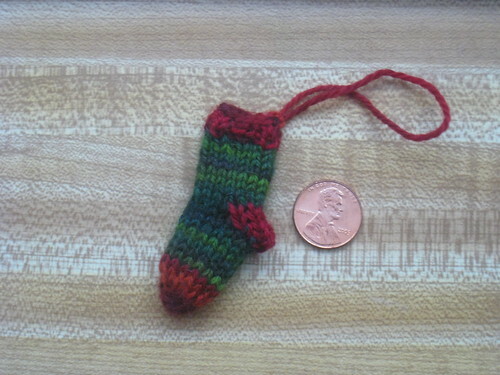 Teeny Tiny Sock is licensed under a Creative Commons Attribution-Noncommercial-Share Alike 3.0 United States License. 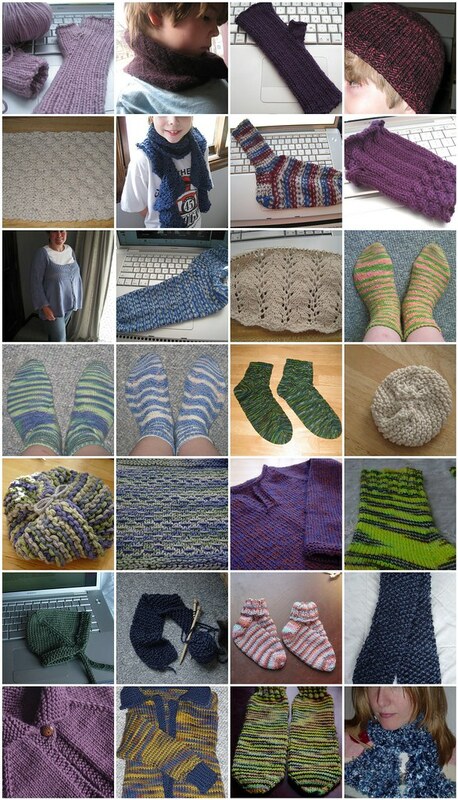 Based on a work at knittinginterrupted.com. The sweater and I were getting along famously. I’ve finished the body and am partway down the first sleeve. I figure I could have it finished in just a couple of good long knitting sessions over a couple of days. 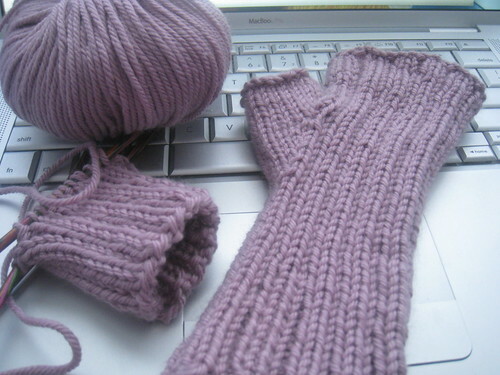 I guess that’s why I decided to take a break from it and cast on and finish these fingerless mitts. I loves them. They are my precious.